Extreme sports games have always held a special place in my gaming heart. I loved Tony Hawk as a kid, and SSX Tricky got more playtime from me than Destiny has. Sadly, more recent iterations of extreme sports games haven’t captured that same exciting magic that came from those classic games more than a decade ago. 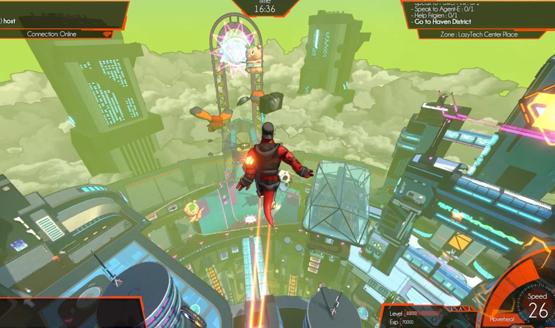 Billed as a multiplayer, open-world parkour game, Hover: Revolt of Gamers is an exciting thrill ride that combines Jet Set Radio with Mirror’s Edge, set in a world inspired by the likes of Star Wars and The Fifth Element. If that’s not a recipe that instantly generates excitement, I’m not sure what is. My hands-on demo put me instantly into the open world of Hover City with other online players, people playing PC at that very moment. Already out on PC right now, Hover will allow for cross-play between PC and PS4 players when it launches on console. The controls were quick and easy to get used to, and I soon found myself zipping around the environment, grinding across different rails and launching off the tops of buildings. Easily my favorite feature was the ability to rewind myself, so if I missed landing on a certain platform, I could just rewind and try again. This kind of instant replayability makes a game like Hover more fun to try and master, as retrying certain jumps or lines is much easier than either having to wait for it to load and restart, or working your way back to that area again. I stopped by a couple of missions that people in the area were offering. The first was a quick race through some gates that I sadly failed because I got carried away with an epic grind and missed my exit. The next was an exciting tournament between other live players that involved getting a ball to one side of a small arena to score, kind of like just about every other sports game out there. As much as I harbor a disdain for sports, something about futuristic light-skates football in a digital arena was incredibly fun. After that I began cruising around the world again, and the developer showed me how I could switch into a nauseatingly disorienting first-person mode. It might be fun for the novelty, but if I want any hope of doing well in this game, I’ll stick to third-person. Hover doesn’t have to be a multiplayer game if you prefer your futuristic skating games to be solo. You can instantly swap in and out of the multiplayer and single-player modes without interrupting the game at all. The developer told me that there are a lot of diverse mission types, aside from the ones I tried out, including stealth styled missions and trick competitions. You can also create your own challenges that other players online can undertake, similar to Ubisoft’s Steep. It seems like there is a lot to do in Hover, yet it’s also great for those moments when you just want to cut loose and parkour around a futuristic city for a few minutes, so there will be something for everyone when Hover launches on PlayStation 4 next year.